A false-color image of the Great Red Spot of Jupiter from Voyager 1. The white oval storm directly below the Great Red Spot has the approximate diameter of Earth. The Great Red Spot is a persistent high-pressure region in the atmosphere of Jupiter, producing an anticyclonic storm, the largest in the Solar System, 22 degrees south of the planet's equator. It has been continuously observed since 1830. Earlier observations from 1665 to 1713 are believed to be of the same storm; if this is correct, it has existed for at least 350 years. The Great Red Spot may have existed since before 1665, but the present spot was first seen only after 1830 and well-studied only after a prominent apparition in 1879. The storm that people had seen in the 1600s may have been a different storm than the one we see today. A long gap separates its period of current study after 1830 from its seventeenth-century discovery; whether the original spot dissipated and reformed, whether it faded, or even if the observational record was simply poor, are all unknown. For example, its first sighting is often credited to Robert Hooke, who described a spot on the planet in May 1664; however, it is likely that Hooke's spot was in another belt altogether (the North Equatorial Belt, versus the current Great Red Spot's location in the South Equatorial Belt). Much more convincing is Giovanni Cassini's description of a "permanent spot" the following year. With fluctuations in visibility, Cassini's spot was observed from 1665 to 1713; however, the 118-year observational gap makes the identity of the two spots inconclusive, and the older spot's shorter observational history and slower motion than the modern spot make their identity unlikely. A minor mystery concerns a Jovian spot depicted in a 1711 canvas by Donato Creti, which is exhibited in the Vatican. Part of a series of panels in which different (magnified) heavenly bodies serve as backdrops for various Italian scenes, and all overseen by the astronomer Eustachio Manfredi for accuracy, Creti's painting is the first known to depict the Great Red Spot as red. No Jovian feature was explicitly described in writing as red before the late 1800s. At the start of 2004, the Great Red Spot had approximately half the longitudinal extent it had a century ago, when it reached a size of 40,000 km (25,000 mi). At the present rate of reduction it would become circular by 2040. It is not known how long the spot will last, or whether the change is a result of normal fluctuations. A smaller spot, designated Oval BA, formed recently on March 2000 from the merging of three white ovals, has turned reddish in color. 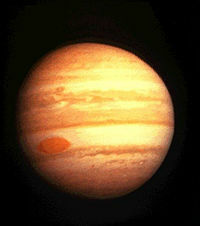 Astronomers have named it the Little Red Spot or Red, Jr. As of 5 June 2006, the Great Red Spot and Oval BA appeared to be approaching convergence. The storms pass each other about every two years but the passings of 2002 and 2004 were of little significance. Amy Simon-Miller, of the Goddard Space Flight Center, predicted the storms would have their closest passing on 4 July 2006. She worked with Imke de Pater and Phil Marcus of UC Berkeley, and a team of professional astronomers since April 2006 to study the storms using the Hubble Space Telescope; on 20 July 2006, the two storms were photographed passing each other by the Gemini Observatory without converging. In May 2008 a third storm turned red. The Great Red Spot should not be confused with the Great Dark Spot, a feature observed near the northern pole of Jupiter in 2000 with the Cassini–Huygens spacecraft. Note that a feature in the atmosphere of Neptune was also called the Great Dark Spot. The latter feature was imaged by Voyager 2 in 1989, and may have been an atmospheric hole rather than a storm and it was no longer present as of 1994 (although a similar spot had appeared farther to the north). On 25 February 1979, when the Voyager 1 spacecraft was 9,200,000 km (5,700,000 mi) from Jupiter it transmitted the first detailed image of the Great Red Spot back to Earth. Cloud details as small as 160 km (99 mi) across were visible. The colorful, wavy cloud pattern seen to the left (west) of the Red Spot is a region of extraordinarily complex and variable wave motion. The Juno spacecraft, which entered into a polar orbit around Jupiter in 2016, flew over the Great Red Spot upon its close approach to Jupiter on 11 July 2017, taking several images of the storm from a distance of about 8,000 km (5,000 mi) above the surface. Over the duration of the Juno mission, the spacecraft will continue to study the composition and evolution of Jupiter's atmosphere, especially its Great Red Spot. Jupiter's Great Red Spot rotates counter-clockwise, with a period of about six Earth days or fourteen Jovian days. Measuring 16,350 km (10,160 mi) in width as of 3 April 2017, Jupiter's Great Red Spot is 1.3 times the diameter of Earth. The cloud-tops of this storm are about 8 km (5.0 mi) above the surrounding cloud-tops. Infrared data have long indicated that the Great Red Spot is colder (and thus, higher in altitude) than most of the other clouds on the planet. The upper atmosphere above the storm however, has substantially higher temperatures than the rest of the planet. Acoustic (sound) waves rising from the turbulence of the storm below have been proposed as an explanation for the heating of this region. Careful tracking of atmospheric features revealed the Great Red Spot's counter-clockwise circulation as far back as 1966, observations dramatically confirmed by the first time-lapse movies from the Voyager fly-bys. The spot is confined by a modest eastward jet stream to its south and a very strong westward one to its north. Though winds around the edge of the spot peak at about 432 km/h (268 mph), currents inside it seem stagnant, with little inflow or outflow. The rotation period of the spot has decreased with time, perhaps as a direct result of its steady reduction in size. The Great Red Spot's latitude has been stable for the duration of good observational records, typically varying by about a degree. Its longitude, however, is subject to constant variation. Because Jupiter does not rotate uniformly at all latitudes, astronomers have defined three different systems for defining the longitude. System II is used for latitudes of more than 10 degrees, and was originally based on the average rotational period of the Great Red Spot of 9h 55m 42s. Despite this, however, the spot has "lapped" the planet in System II at least 10 times since the early nineteenth century. Its drift rate has changed dramatically over the years and has been linked to the brightness of the South Equatorial Belt, and the presence or absence of a South Tropical Disturbance. Color animation of Jupiter's cloud motion and circulation of the Great Red Spot. It is not known exactly what causes the Great Red Spot's reddish color. Hypotheses supported by laboratory experiments suppose that the color may be caused by chemical products created from the solar ultraviolet irradiation of ammonium hydrosulfide and the organic compound acetylene, which produces a reddish material – likely complex organic compounds called tholins. The high altitude of the compounds may also contribute to the coloring of the Great Red Spot. The Great Red Spot varies greatly in hue, from almost brick-red to pale salmon, or even white. In fact, the spot occasionally "disappears", becoming evident only through the Red Spot Hollow, which is its location in the South Equatorial Belt (SEB). Its visibility is apparently coupled to the SEB; when the belt is bright white, the spot tends to be dark, and when it is dark, the spot is usually light. These periods when the spot is dark or light occur at irregular intervals; as of 1997, during the preceding 50 years, the spot was darkest in the periods 1961–1966, 1968–1975, 1989–1990, and 1992–1993. There is no definitive theory as to what causes the formation or color of the Great Red Spot. Laboratory studies are examining the effects that cosmic rays or UV Light from the Sun have on the chemical composition of the clouds of Jupiter. One question is whether the Sun's radiation reacts with ammonium hydrosulfide in the planet's outer atmosphere to create the deep red color. Research suggests that the storm produces extreme amounts of gravity waves and acoustic waves, owing to the turbulence of the storm. The acoustic waves travel vertically upwards to a height of 500 mi (800 km) above the storm where they break in the upper atmosphere, converting wave energy into heat. This creates a region of upper atmosphere that is 1600 Kelvin - which is several hundred Kelvin warmer the rest of the planet at this altitude. The effect is described as being like "crashing [..] ocean waves on a beach". The reason the storm has continued to exist for centuries is that there is no planetary surface to provide friction (only a liquid core of hydrogen); circulating gas eddies persist for a very long time in the atmosphere because there is nothing to oppose their angular momentum. ^ Chang, Kenneth (2017-12-13). "The Great Red Spot Descends Deep Into Jupiter". The New York Times. Retrieved 2017-12-15. ^ Editors. "Great Red Spot". ENCYCLOPÆDIA BRITANNICA. Retrieved 2018-12-04. ^ Staff (2007). "Jupiter Data Sheet – SPACE.com". Imaginova. Retrieved 2008-06-03. ^ Anonymous. "The Solar System - The Planet Jupiter – The Great Red Spot". Dept. Physics & Astronomy – University of Tennessee. Retrieved 2015-08-30. ^ Karl Hille (2015-08-04). "Jupiter's Great Red Spot: A Swirling Mystery". NASA. Retrieved 2017-11-18. ^ a b Beebe (1997), 38-41. ^ Staff (2003). "Astronomical Observations: Donato Creti". Vatican Museums. Retrieved 2007-06-15. ^ a b Hockey (1999), 40-1. ^ Beatty, J. Kelly (2002). "Jupiter's Shrinking Red Spot". Sky and Telescope. 103 (4): 24. Retrieved 2007-06-21. ^ Sanchez-Lavega, A.; et al. (February 2001). "The Merger of Two Giant Anticyclones in the Atmosphere of Jupiter". Icarus. 149 (2): 491–495. Bibcode:2001Icar..149..491S. doi:10.1006/icar.2000.6548. ^ Phillips, Tony. "Huge Storms Converge". Science@NASA. Archived from the original on 2007-02-02. Retrieved 2007-01-08. ^ Michaud, Peter. "Gemini Captures Close Encounter of Jupiter's Red Spots". Gemini Observatory. Retrieved 2007-06-15. ^ Shiga, David. "Third red spot erupts on Jupiter". New Scientist. Retrieved 2008-05-23. ^ Phillips, Tony. "The Great Dark Spot". Science at NASA. Archived from the original on 2007-06-15. Retrieved 2007-06-20. ^ Smith et al (1979), 951-972. ^ Chang, Kenneth (2016-07-05). "NASA's Juno Spacecraft Enters Into Orbit Around Jupiter". The New York Times. Retrieved 2017-07-12. ^ a b c Perez, Martin (2017-07-12). "NASA's Juno Spacecraft Spots Jupiter's Great Red Spot". NASA. Retrieved 2017-07-16. ^ Smith et al (1979), 954. ^ O’Donoghue, J.; Moore, L.; Stallard, T. S.; Melin, H. (27 July 2016). "Heating of Jupiter's upper atmosphere above the Great Red Spot". Nature. 536 (7615): 190–192. doi:10.1038/nature18940. ^ Rogers, John. "Interim reports on STB (Oval BA passing GRS), STropB, GRS (internal rotation measured), EZ(S. Eq. Disturbance; dramatic darkening; NEB interactions), & NNTB". British Astronomical Association. Retrieved 2007-06-15. ^ Reese, Elmer J.; Solberg, H. Gordon (1966). "Recent measures of the latitude and longitude of Jupiter's red spot". Icarus. 5 (1–6): 266–273. Bibcode:1966Icar....5..266R. doi:10.1016/0019-1035(66)90036-4. ^ Stone, Peter H. (1974). "On Jupiter's Rate of Rotation" (PDF). Journal of the Atmospheric Sciences. 31 (5): 1471–1472. Bibcode:1974JAtS...31.1471S. doi:10.1175/1520-0469(1974)031<1471:OJROR>2.0.CO;2. Retrieved 2007-06-20. ^ Rogers (1995), 48, 193. ^ Loeffer, Mark J.; Hudson, Reggie L. (2018). "Coloring Jupiter's clouds: Radiolysis of ammonium hydrosulfide (NH4SH)". Icarus. 302: 418–425. doi:10.1016/j.icarus.2017.10.041. Retrieved 2019-03-13. ^ "What makes Jupiter's Red Spot red?". EarthSky. 2014-11-11. Retrieved 2019-03-13. ^ "Jupiter's Great Red Spot: A Swirling Mystery". NASA. August 4, 2015. Goddard scientists Mark Loeffler and Reggie Hudson have been performing laboratory studies to investigate whether cosmic rays, one type of radiation that strikes Jupiter’s clouds, can chemically alter ammonium hydrosulfide to produce new compounds that could explain the spot’s color. ^ "Jupiter's Great Red Spot Likely a Massive Heat Source". NASA. NASA. Retrieved 23 December 2018. ^ "Jupiter's Atmosphere and Great Red Spot". www.astrophysicsspectator.com. November 24, 2004. [Numerous authors] (1999). Beatty, Kelly J.; Peterson, Carolyn Collins; Chaiki, Andrew, eds. The New Solar System (4th ed.). Massachusetts: Sky Publishing Corporation. ISBN 978-0933346864. Beebe, Reta (1997). Jupiter the Giant Planet (2nd ed.). Washington: Smithsonian Books. ISBN 978-1560986850. Hockey, Thomas (1999). Galileo's Planet: Observing Jupiter Before Photography. Bristol, Philadelphia: IOP Publishing. ISBN 978-0750304481. Peek, Bertrand M. (1981). The Planet Jupiter: The Observer's Handbook (Revised ed.). London: Faber and Faber Limited. ISBN 978-0571180264. Rogers, John H. (1995). 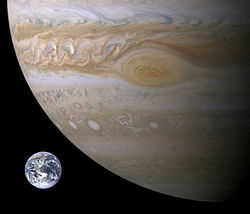 The Giant Planet Jupiter. Cambridge: Cambridge University Press. ISBN 978-0521410083. Smith, B. A.; et al. (1979). "The Jupiter system through the eyes of Voyager 1". Science. 204 (4396): 951–957, 960–972. Bibcode:1979Sci...204..951S. doi:10.1126/science.204.4396.951. PMID 17800430. Wikimedia Commons has media related to Great Red Spot. Yang, Sarah (April 21, 2004). "Researcher predicts global climate change on Jupiter as giant planet's spots disappear". UC Berkeley News. Retrieved 2007-06-14. Phillips, Tony (March 3, 2006). "Jupiter's New Red Spot". Science at NASA. Archived from the original on October 19, 2008. Retrieved 2007-06-14. Phillips, Tony (June 5, 2006). "Huge Storms Converge". Science at NASA. Retrieved 2007-06-14. Youssef, Ashraf; Marcus, Philip S. (2003). "The dynamics of jovian white ovals from formation to merger". Icarus. 162 (1): 74–93. Bibcode:2003Icar..162...74Y. doi:10.1016/S0019-1035(02)00060-X. Williams, Gareth P. (May 4, 2005). "NOAA Web Page". Geophysical Fluid Dynamics Laboratory. Retrieved 2007-07-21.